Google Local Search introduces Service Areas, Google Local Business Center. Adding a listing to Google Local Business Center helps your local bricks and mortar business get found by web searchers. Google Local Business Center is integrated with Google local search – that list of results that show up as a map with locations. 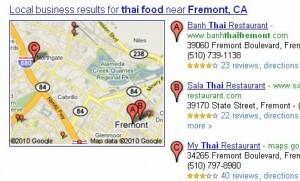 If you type in a search term plus a geographic term such as “Thai food Fremont” you will often get these “map” results. The problem has been that you needed a business address for this to really work for you. Many home based businesses don’t want to publish their home addresses and their service area may be different than where they live. Some home based businesses have gotten PO Boxes just to get a better listing in local search. But a pin on a map that points to a PO Box isn’t necessarily that useful. Well a fix from google now available. 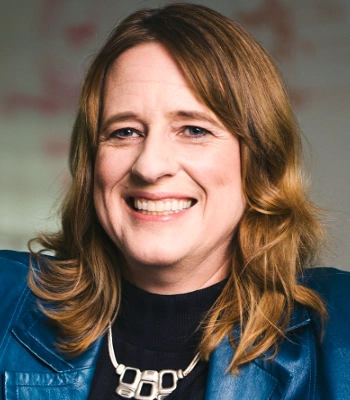 In an indepth interview with Eric Enge, Carter Maslan shares the concept of service areas that google is introducing. If you are a dog walker that serves an area differently than where you live, this update is for you. You can now specify what area you want to appear in for a local search. Check out the service area help page for more info.